At Olio e Limone, Alberto Morello makes a play on a familiar Italian appetizer with his “CARPACCIO” of pear. Cut lengthwise into thin, transparent slices, it looks like a botanical illustration for pear. Fanned out on the plate, the slices are strewn with crumbled Gorgonzola dolce (that glorious mild blue) and fresh walnuts. 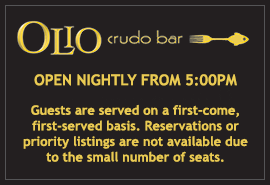 Olio e Limone, 17 W. Victoria St., Santa Barbara; (805) 899-2699. Pear carpaccio, $8.95. Entrees, $16.95 to $23.95. – S.I.V.